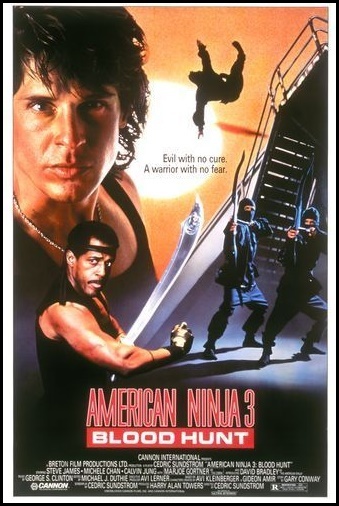 Chrichton's World: Review American Ninja 3: Blood Hunt (1989): Heavily flawed but filled with great combat! Review American Ninja 3: Blood Hunt (1989): Heavily flawed but filled with great combat! The third film in the American Ninja franchise wasn't well received since according to many it was a major downgrade on previous films. While I agree it's a lesser film than the first two I don't think it's real bad. It does have some redeeming factors. For some reason Canon Films didn't want Sam Firstenberg to direct this one which I think was a big mistake. He was the one who made American Ninja exciting and believable. And he was capable to compensate the lack of poor story with other elements to keep the film entertaining. In an interview Sam explains that it was a matter of economics. But even if that was true they still could have approached him. Michael Dudikoff also didn't return. Apparently this was because of filming in South-Africa during Apartheid. He was pressured to not go there so he didn't. For American Ninja he did return but demanded they filmed in Lesotho A small country near South-Africa. While for a lot of people him deciding to pull out of the movie was an issue I don't see it as a big problem. His replacement, David Bradly, believe it or not was a good choice. Unlike Michael Dudikoff he is a martial artist which made the fights a whole lot better than in previous films. The combat is a huge improvement. Somehow this redeeming factor gets overlooked by many. And for a man who barely had acted before he did a real good job. However he is let down by poor scripting and worse direction. Director Cedric Sundstrom didn't know what to do with ninja's. He obviously had problems taking them seriously and therefore you have a lot of scenes that look more like a parody of the franchise than a serious continuation. And you know what I would have embraced it if the whole was approached like that. Problem is that a lot of scenes were intended to be taken seriously making American Ninja 3: Blood Hunt a little messy. It also doesn't help that the story is incoherent. Main baddie called The Cobra needs Sean Davidson (Bradley) to test a deadly virus on. It's never made clear why they need him in particular just that they do. Somehow The Cobra knows all about this American Ninja even when the audience just got introduced to him. Michele B. Chan as Chan Lee was a nice change of pace since not only is she the first female ninja in the franchise she also is a far more complex character than Black Star Ninja and Tojo Ken combined. Too bad that Michele isn't a martial artist and rarely is shown fighting. When her character does come into action it's obvious a stunt double was used. Chan Lee also has a particular set of skills that makes her even more unique but I won't spoil it for you since it's a nice surprise. Then there is Dexter. There is no reason for him to be there at all. He is clearly there to provide comic relief but did they forget that Steve James already had that covered. Dexter is taking up space and messes up the bromance between Curtis and Sean. Another character that made no sense whatsoever was General Andreas. I know he was supposed to come of as explosive and dangerous. Instead he was one big joke from start to finish. He killed Sean's father but for the most part Sean wasn't bothered or handicapped by this much until one scene where he suddenly remembers what had happened to his father. Another ridiculous thing about the murder scene was the fact that the voice of younger Sean is dubbed. They used a much older actor to do the voice of a boy whose balls hadn't dropped yet. It completely detracts from the drama that has unfolded. So yes, this third part in the franchise is heavily flawed and perhaps a little too comical for it's own good. But the fighting is superior compared to previous films. The film should be commended for that.